'Remove before flight' – this writing can often be read on small red flags on parked airplanes. Usually they are attached to brakes, engine parts and the aircraft propeller. This also applies to the Swiss aircraft manufacturer Pilatus Flugzeugwerke AG in Stans. Small plugs on the flags prevent sensitive parts or openings on the aircraft from getting dirty or clogged. They must be removed before every flight. 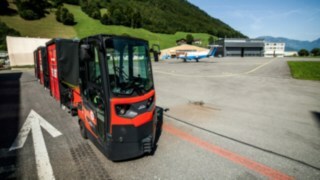 At the Pilatus headquarters in Stans, however, one notices the lettering not only on the parked aircraft on the airfield, but also on the Linde tugger train, which ensures the material supply to production. The company's growth course presents the production with challenges. 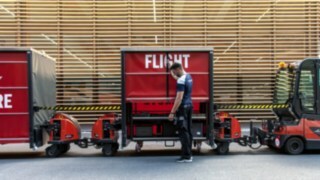 "For us in production, intralogistics is crucial and the right selection of suitable industrial trucks is an important strategic decision," says Yves Müller, Tugger train Project Manager at Pilatus. The focus is always on-time completion and delivery to the customer. Müller explains. 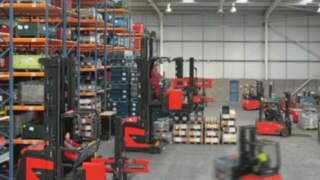 In addition, international spare parts availability must be ensured within 24 hours 365 days a year. 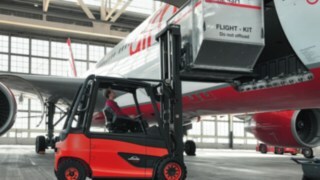 This could not be achieved without a well-rehearsed team and flawless intralogistics, emphasizes Müller. The constant growth of the entire company is reflected in the Pilatus headquarters. With a view to the production of the PC-24, a new 10,000 square meter assembly hall was built, which will enable the assembly of 140 aircraft per year since summer 2017. 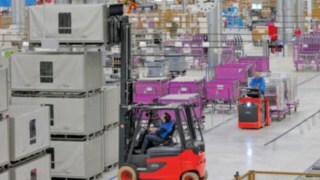 New manufacturing and assembly buildings have resulted in increasing internal transports with forklifts and other transport vehicles, as the distances between the individual production sites are getting longer and longer. In addition, material for production and individual aircraft parts must be moved over the entire production area in Stans. The solution: A tugger train from Linde suitable for outdoor operation. Pilatus has been operating its tugger train since January 2016. Like a train, it runs various production and assembly tours on the entire factory premises according to a station principle. It stops for the loading and / or unloading of the various aircraft parts, from the small screw to the larger metal parts, at 30 fixed stations. 'The tugger train is the core element for a functioning intralogistics system', says Müller. 'Of course, this has to happen just in time when production needs the material. 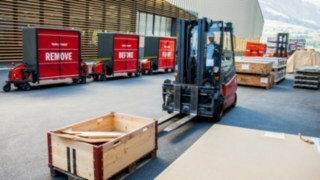 And it has to be done on a regular basis so that there is not too much material on top of each other in the production plant,' says Müller, explaining the use of the Linde route train on the company premises. Currently, the route train runs in single-shift operation and, if required, in two- and four-hour cycles from the company's own stations. Especially the production of the new business jet PC-24 requires the fast transport of many parts on the factory premises. The FT08 modular tugger train consists of a Linde P80 tractor as tractor and three goods carriers. 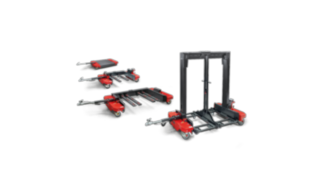 Each trolley can be loaded and unloaded from both sides and has a very small turning circle with a possible steering angle of 120 degrees. 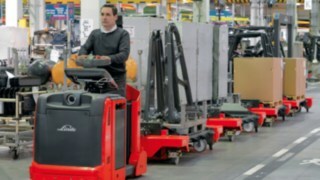 Linde offers customers a clear advantage over its competitors here, as the product carriers are steered on both axles. 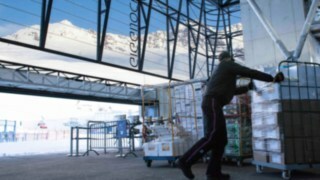 This makes the route train ideal for the production lines in the Pilatus plants. 'We can drive in very tight environments in production and assembly. That is why we at Pilatus are completely satisfied,' emphasises Yves Müller. 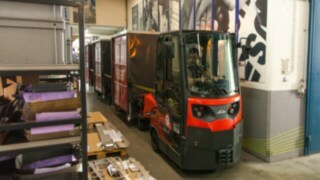 In addition, the tugger train is equipped for year-round outdoor operation, which is indispensable for production processes in various production plants: the lighting system, swing axle with spring system and weatherproof goods carriers enable it to be used throughout the Pilatus factory premises and for outdoor trips between the individual assembly halls. 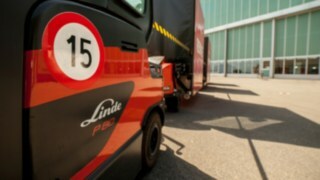 'Linde does not make empty promises to its customers, but delivers exactly what has been promised. We have been able to increase efficiency,' says Yves Müller, while the train behind his back heads for the next station. 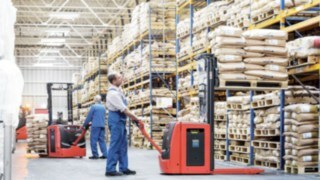 Linde Material Handling is our first point of contact for tailor-made material flow solutions. 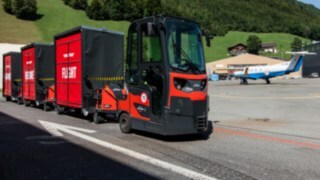 The Linde tugger train has now been touring the Pilatus site for more than two years. During this time, it has helped to supply urgently needed parts to production faster and more efficiently. 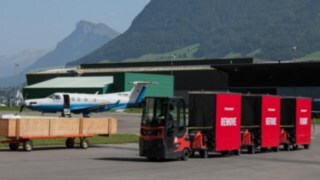 Since the production of the new PC-24 Super Versatile Jet, which is now really picking up speed, requires a large number of parts to be transported across the company premises with priority, Pilatus is already considering purchasing a second route train. 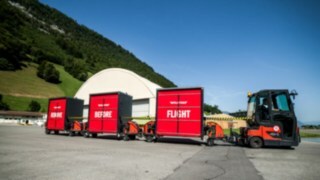 Everything with one goal in mind: on-time delivery - so that Pilatus customers can take off as planned.